The passing of the 2018 Farm Bill lifts all restrictions on industrial hemp cultivation on a Federal level, allowing for the full return of this important American crop. 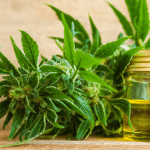 Further, by redefining hemp to include its “extracts, cannabinoids and derivatives,” Congress has made it clear that hemp-derived products, such as CBD, are not considered controlled substances. Hemp requires little to no use of toxic pesticides or herbicides, making it a clean and safe crop to grow. It also grows well in a variety of climates and gives nutrients back to the soil in which it’s grown.Passage of the 2018 Farm Bill means that hemp farmers may now finally access needed crop insurance and fully participate in USDA programs for certification and competitive grants. This is a huge win for farmers. Products like CBD, hemp seed oil and hemp protein are hot. The hemp industry has surpassed $2B in consumer sales ($820M in 2017 alone). Independent health food stores, in particular, have benefited from this growth. Industrial hemp is being used in hundreds of different applications including consumer textiles, personal care, industrial components and health supplements like CBD. US hemp employment has surged to 185,000 full-time employees. By 2020, it’s expected to grow to over a quarter of a million jobs, outpacing manufacturing in many states. Hemp-derived products are used by a wide range of consumers, from athletes to pet owners to aging seniors. PreviousPrevious post:CBD treatment for insomnia and other sleep disorders.